Some of my favorite conversations are those I have with women considering seminary. I’m refreshed to hear of a woman’s hunger to know Christ and make him known among the nations, and of her willingness to invest precious resources into receiving formal training for evangelism and discipleship. In no way must a woman attend seminary in order to be useful in the church, and yet it’s good to celebrate and promote formal theological training among women when such training is pursued in faithfulness to the Scriptures. I’m seeing the Lord raise up women for this training from diverse life stages, backgrounds, interests, and gifts; I’m also hearing more and more churches delight in the blessing of having theologically trained women serve in various ministry areas—for the good of the whole congregation in joyful submission to pastors and elders. 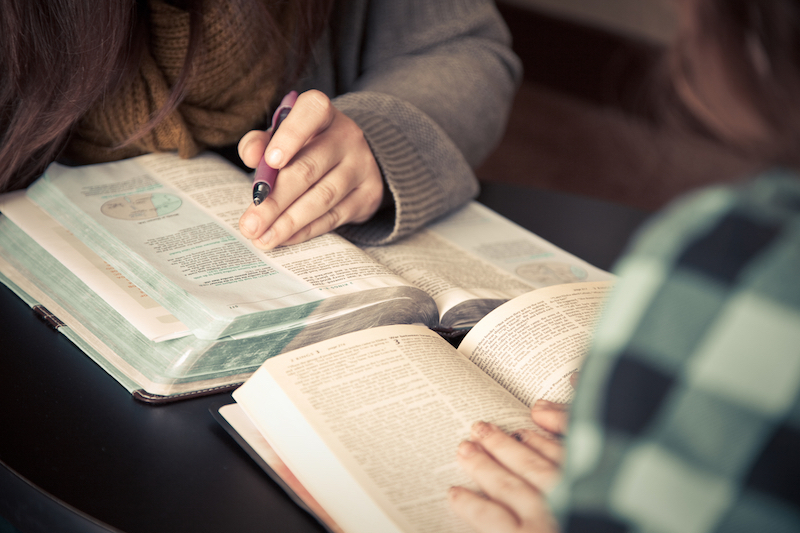 Here are four preliminary questions I usually ask someone considering seminary before we come to discuss the particular degree program or school that might best suit her interests. The first thing I want to know is why she’s considering seminary. Does her desire for further training spring from a growing hunger to serve God’s people with the truth and grace of Jesus? Has she prayed and sought the Scriptures for a season of time about this decision? How does she see seminary as the best way to be equipped for the work of ministry God has set before her? 2. Have you been encouraged to consider seminary by those who know you well—especially within your local church? Some speak of both an internal and an external call with respect to vocation. Applied to the matter at hand, this means a woman senses God’s Spirit prompting her to pursue training for ministry (internal call), and the body of Christ recognizes and affirms particular gifts for such ministry (external call). A woman can experience the synergy of these calls when she’s invested wholeheartedly in her local congregation, so that she can dialogue openly and honestly with her pastors and church family. It’s also important we ask questions of and receive feedback from godly family and friends who may not be members of our church but who know us well. I’m thankful to bear personal witness to the beauty and power of the gospel at work among Christ’s body when a local church raises up a woman in the knowledge and love of Christ, commissions her formally or informally for seminary training, supports her financially, sets apart an older sister mentor to encourage her from semester to semester, and prays for her regularly throughout her course of study. But what if we sense an internal call to enter seminary but haven’t received a strong external call? A number of reasons can explain this situation, and each requires wisdom. Perhaps the pastors see issues relating to personal discipline, spiritual maturity, or ministry giftedness that need to be discussed first; we should be grateful for spiritual leaders who ask such questions for our good. Perhaps we don’t have relationships with brothers and sisters in our church who could offer true and profitable feedback; in that case we’ll need to evaluate the nature of our connection to this congregation and prayerfully consider means to deepen our fellowship. In some contexts, perhaps key leaders do not consider seminary a valuable option in general for a woman; we then prayerfully seek truthful and gracious conversation with our pastors and elders before seeking other counsel, which we must do in some cases. As members of a church, we want to enjoy the privileges of being family in Christ, including the privilege of receiving wisdom and direction from those who love and care for our souls. 3. To the best of your ability, have you assessed the risks and counted the costs of this decision? Are you prepared to make these sacrifices joyfully? It’s only fitting that the first step to receive formal training for a lifetime of occupational servant ministry involves risk. When we assess the personal costs of seminary soberly, we’re prepared to sacrifice joyfully. By sharing this story I’m not suggesting all of us throw caution and sound judgment to the wind. It’s important for us to consider the difficult job market for theologically trained women seeking positions in churches, seminaries, or other ministries (though I pray regularly that more churches, in particular, would employ women to evangelize, disciple, and train other women in their congregations, and I see hopeful signs in this area). It’s important for us to think about things like financial debt and the untold hours we will spend reading in a library. What I’m suggesting, though, is that the decision to enroll in seminary is always one that involves risk and sacrifice. And this is good. Some risks and costs vary based on a woman’s life stage. For example, I’m having more conversations with young mothers considering seminary. Most opt for an online or weekend one-course-a-semester approach. Because many young moms have less control over their schedules, they take it semester by semester and adjust their pace according to their responsibilities as a wife and/or mom. Some of my friends have continued after one semester, while others have decided this commitment wasn’t best for their family, even though they’re grateful for the one course they took. They tell me how vital it is to make a family decision, since the whole family will be affected by Mom’s new commitments. When the family makes the decision together, they more willingly bear the costs and count it all joy together for the sake of Christ. One friend’s family wasn’t enthusiastic about her seeking formal training in this season, so she’s availing herself joyfully of the many opportunities for informal training (e.g., the resources for handling Scripture listed here or here). As a bit of an aside: humanly speaking, I don’t know of any better training ground for a life of Christian servanthood than the Christian servanthood of nurturing little ones day in and day out, mindful of God and overflowing with thanksgiving. 4. Are you willing to invest in a church wholeheartedly while you pursue your seminary degree? Apart from the local church, seminaries cannot train us sufficiently for any sort of gospel ministry. I’m grateful to have attended two seminaries that make explicit and delight in their reliance on local congregations. Those of us enrolled in seminary may need to adjust our particular ministry commitments for a season. Our foundational commitment to and joyful participation in the local church, however, ought to grow during our seminary years. Full engagement in the church enhances an academic experience. We remember why we’re working so hard in the first place—we want to serve people! We have faces of real people with real issues in our minds as we study, and we immediately put into practice what we’re learning. Amid a rigorous season of study, we also need refreshment from brothers and sisters who pray for us, speak God’s truth to us, and show God’s kindness to us. 1. Ask a seminary’s admissions counselor to share a couple email addresses of women who have graduated from the program you’re considering, so you can ask pointed questions and receive honest feedback. 2. Be clear with admissions counselors about your needs and interests when you discuss finances and ministry tracks. Ask about scholarships that are immediately available as well as those that might become available in the near future. 3. Consider visiting a seminary campus as early as possible, even if you’re thinking about an online program. Campus visits often play a major role in the discernment process (as my admissions counselor friends tell me). May God bless you richly in Christ Jesus as you humbly discern whether or not to undertake seminary training!